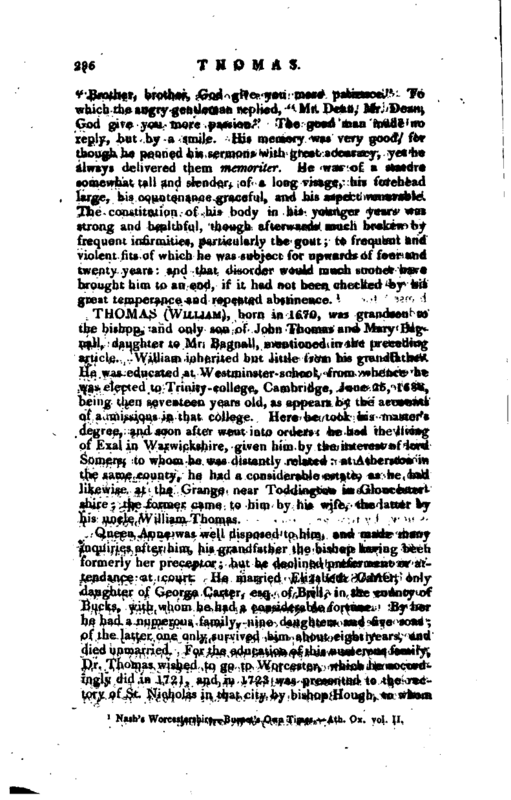 , born in 1670, was grandson to the bishop, and only son of John Thomas and Mary Bagnail, daughter ‘to Mr. Bagnall, mentioned in the preceding article. William inherited but little from his grandfather. He was educated at Westminster-school, from whence he was elected to Trinity-college, Cambridge, June 25, 1688, being then seventeen years old, as appears by the accounts of admissions in that college. Here he took his master’s degree, and soon after went into orders: he had the living ef Exal in Warwickshire, given him by the interest of lord Somers, to whom he was distantly related: at Atherston in the same county, he had a considerable estate, as he had likewise at the Grange near Toddington in Gloucestershire; the former came to him by his wife, the latter by his uncle William Thomas. Queen Anne was well disposed to him, and made many inquiries after him, his grandfather the bishop having been formerly her preceptor; but he declined preferment or attendance at court. He married Elizabeth Carter, only daughter of George Carter, esq. of Brill, in the county of Bucks, with whom he had a considerable fortune. By her he had a numerous family, nine daughters and five sons; of the latter one only survived him about eight years, and died unmarried. 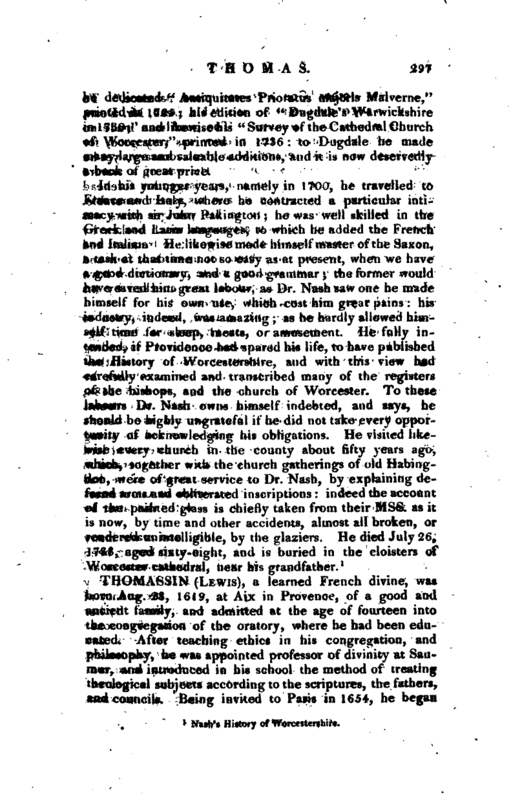 For the education of this numerous family, Dr. Thomas wished to go to Worcester, which he accordingly did in 1721, and in 1723 was presented to the rectory of St. Nicholas in that city by bishop Hough, to whom | he dedicated “Antiquitates Prioratus majoris Malverne,” printed in 1725; his edition of “Dugdale’s Warwickshire in 1730;” and likewise his “Survey of the Cathedral Church of Worcester,” printed in 1736: to Dugdale he made many large and valuable additions, and it is now deservedly a book of great price.